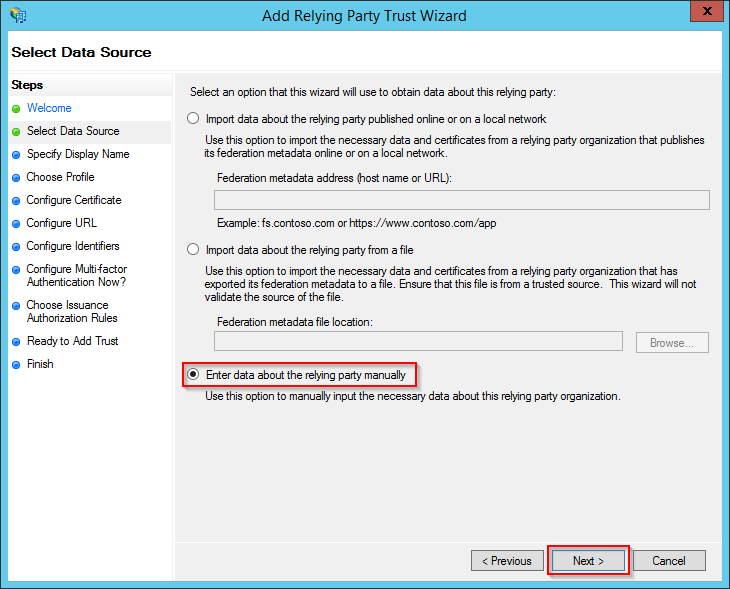 The Add Relying Party Trust Wizard will open. Click the Start button to begin. Select the bottom option to Enter data about the relying party manually and click Next. Enter a name and description for the trust, and click Next. 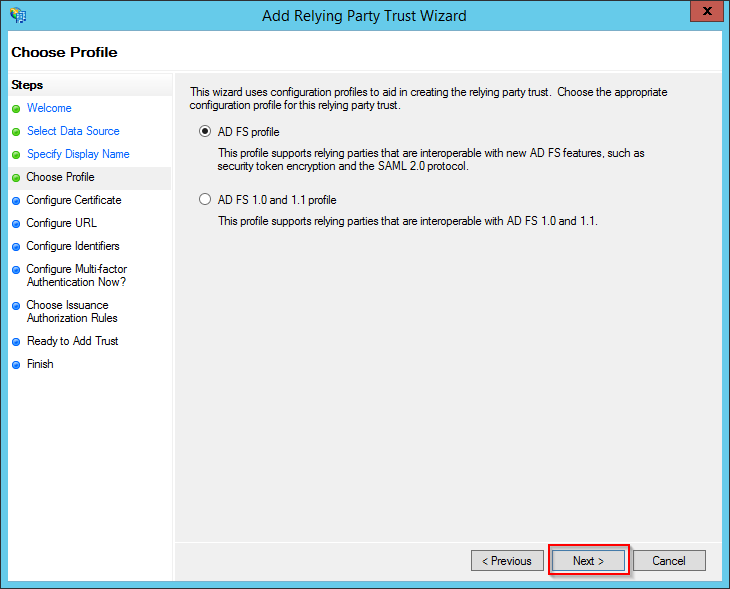 Leave the default of AD FS profile and click Next. Optionally select a token encryption certificate. We'll be skipping this step for this demo. Click Next. Leave the default options, as we'll be relying on the WS-Trust protocol. Click Next. For the Relying party trust identifier, enter the external URL that is used to access your RD Web Access and RD Gateway. Only enter the base URL, do not add \RDWeb or any sub-directories. Click the Add button to add the identifier, and then click Next. 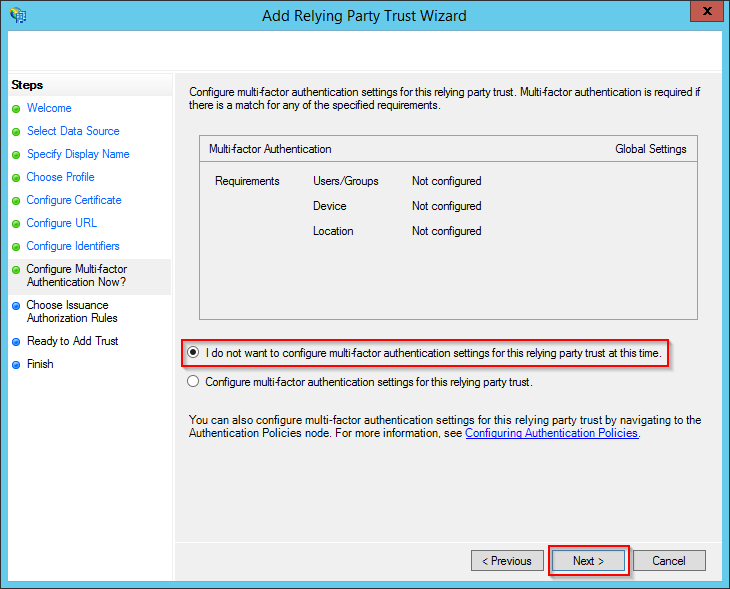 ADFS Multi-factor Authentication is outside the scope of this post, so leave the default option of I do not want to configure multi-factor authentication settings for this relying party trust at this time and click Next. Select the default option of Permit all users to access this relying party and click Next. Click Next to add the trust. 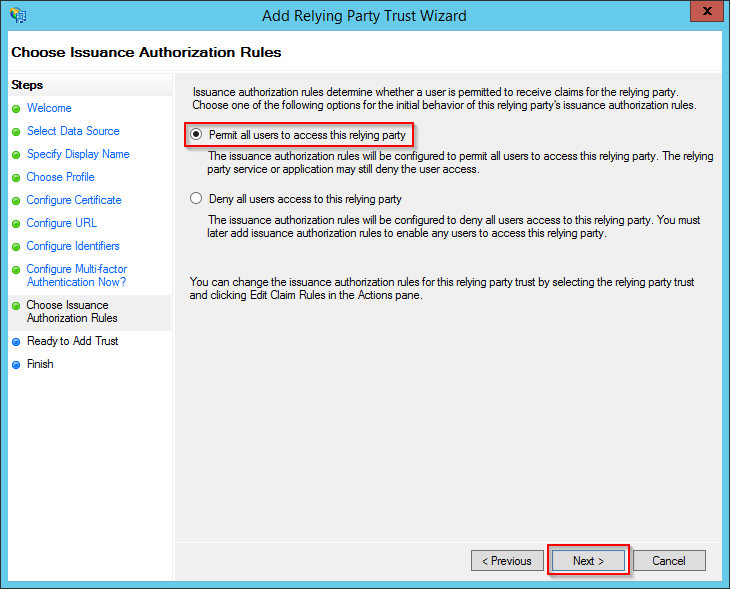 Uncheck the box to edit claim rules, and click the Close button to complete the wizard. 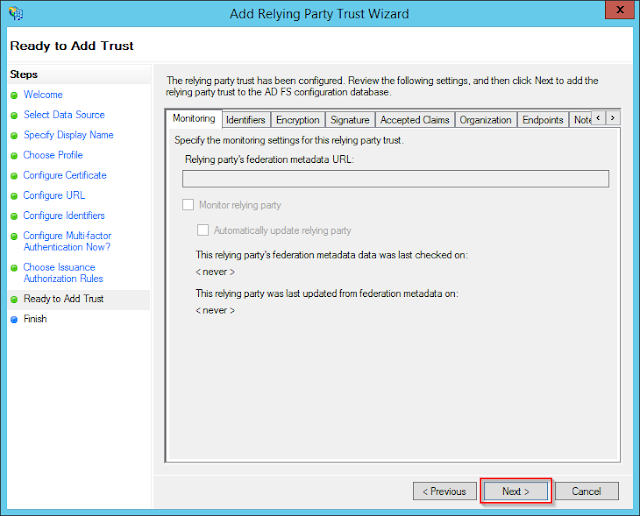 Back in the ADFS Management console, you should now see your RDS relying party trust listed. OK, so let's recap quickly. We've installed ADFS and configured it with our certificate. We've installed WAP and pointed it at the ADFS server. 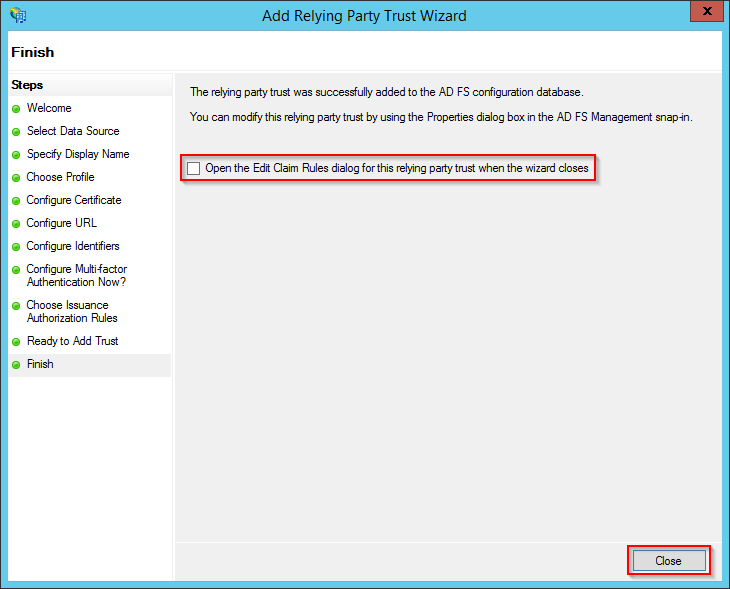 We've created the Relying Party Trust in ADFS for RDS. The next step is to publish RD Gateway through WAP. Connect to your WAP server and switch to the Remote Access Managament console. In the left pane, make sure Web Application Proxy is selected, and then in the right pane, click Publish. 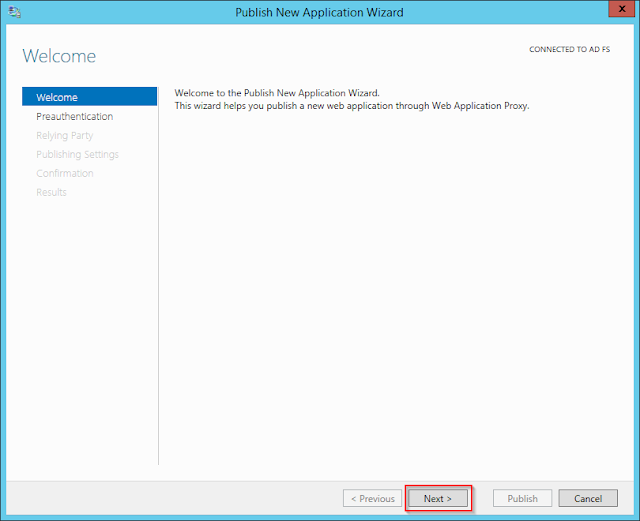 The Publish New Application Wizard will open. Click Next. 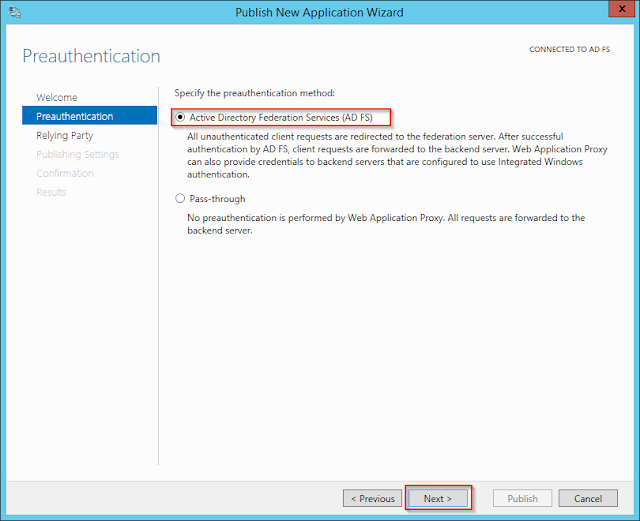 For the preauthentication, select Active Directory Federation Services (AD FS) and click Next. 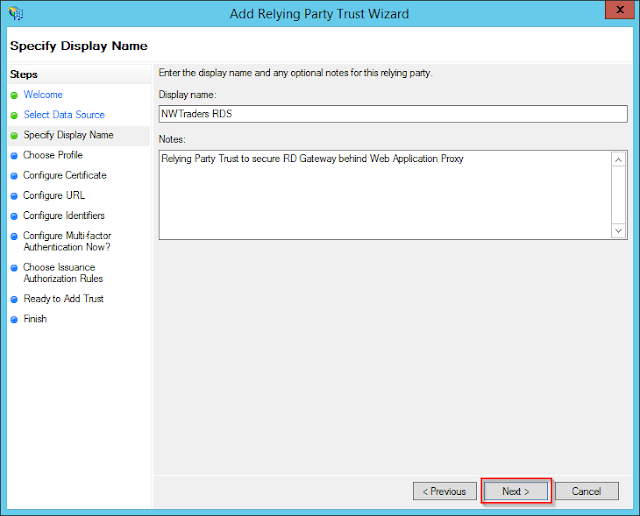 Select the Relying Party Trust that we created earlier, and click Next. Choose a name for this published application - this is for internal use only. 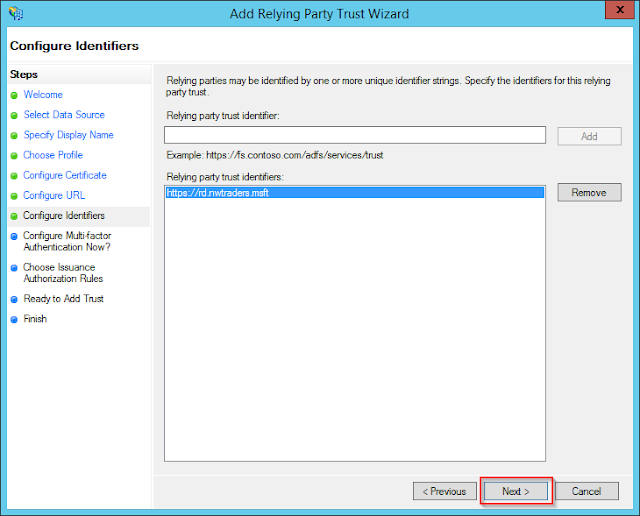 Enter the external URL that users will use to access your RD Gateway/RD Web Access installations, and then select the certificate used by your RD Gateway. Make sure the backend server URL is the same as the external URL. Click Next. Finally, click Close to finish the wizard. 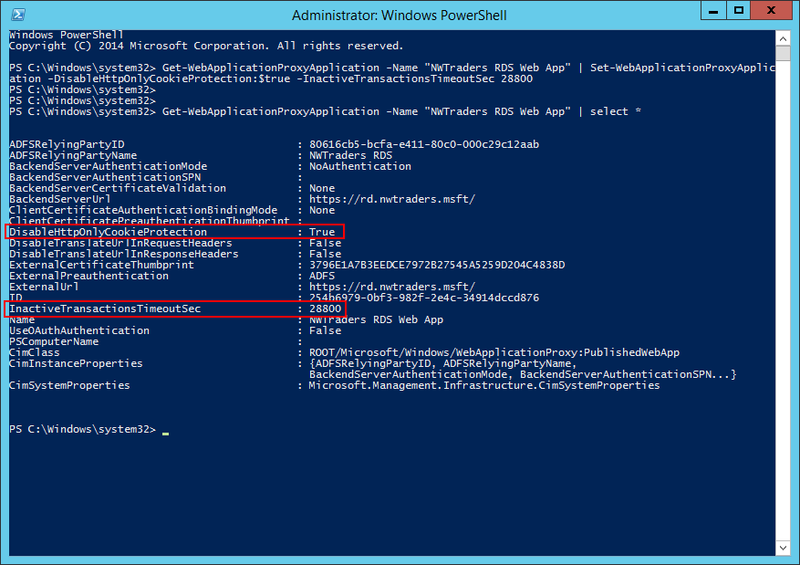 You should now see your published web application in the Remote Access Management console. DisableHttpOnlyCookieProtection - this is required for RD Gateway to function correctly. InactiveTransactionsTimeoutSec - how often an idle session will reset. The default is 300 seconds, meaning if a user's RemoteApp goes idle, it will reset the connection every five minutes - not something we want to happen. ***NOTE*** - This command won't work if you didn't install KB2982037 (HttpOnly Update) per the prerequisites - do so now if you haven't already. The last step in publishing a web application through WAP is to ensure the server can forward correctly to the internal URL of the web application. If your internal DNS name resolution is working fine, then you are good, but otherwise the easiest way to ensure the WAP server forwards correctly is to modify the HOSTS file on your WAP server. 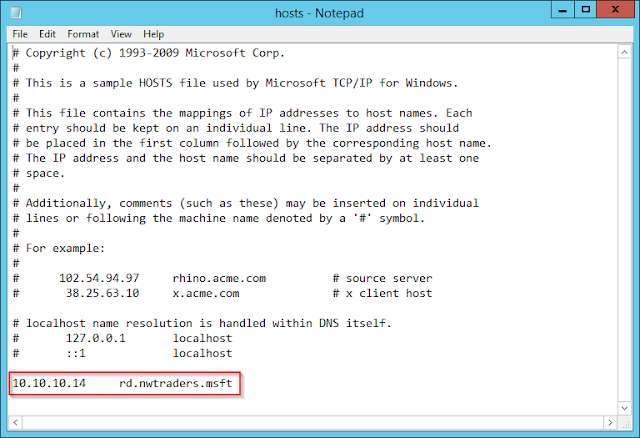 Create an entry in the HOSTS file pointing the internal URL to the correct IP address of your RD Gateway server. At this point, you should be able to access the external URL for your RDS environment, be prompted by the ADFS pre-authentication page, successfully login and get passed onto RD Web Access. However if you try to access a published RemoteApp - it will fail to connect! 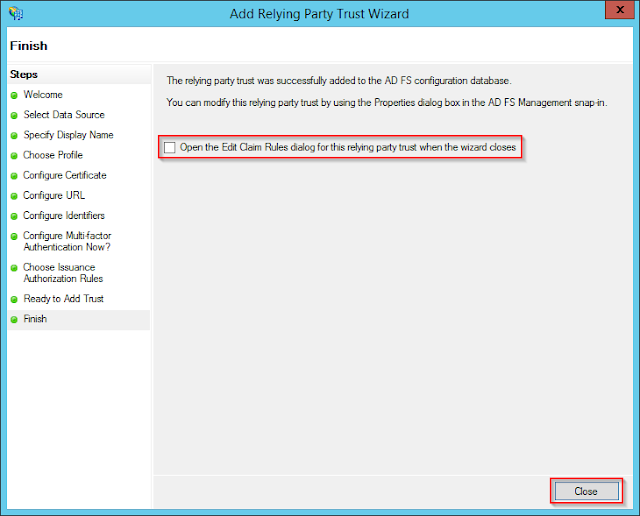 We need to modify both the session collections and virtual desktop collections with a custom RDP property so that the RD Gateway knows how to retrieve the ADFS edge token from the browser, in order to get past WAP. Set-RDSessionCollectionConfiguration -CollectionName <collection_name_here> -CustomRdpProperty "pre-authentication server address:s:https://<external_URL_here>`nrequire pre-authentication:i:1"
Notice for the pre-authentication server address property, the URL is the same as the published URL in WAP. You do not need to add /RDWeb at the end of the URL. Set-RDVirtualDesktopCollectionConfiguration -CollectionName <collection_name_here> -CustomRdpProperty "pre-authentication server address:s:https://<external_URL_here>/rdweb `nrequire pre-authentication:i:1"
Once you've set the pre-authentication settings on each session collection and virtual desktop collection, you'll be able to successfully launch RemoteApps and connect to VDI collections via RD Web Access. 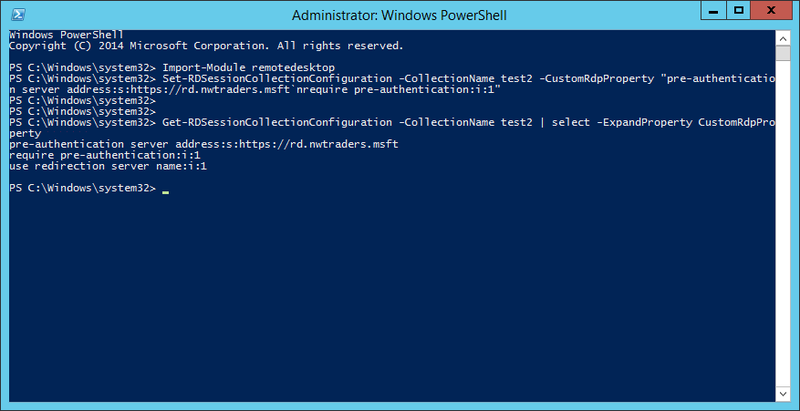 In addition to modifying each Session Collection and Virtual Desktop Collection, if you utilize RD Web Access and the "Connect to a remote PC" link to allow users to remotely access their work computers, you'll also need to modify the Desktops.aspx page to add the pre-authentication RDP properties. Just like when modifying your Session Collections, enter the URL without adding /RDWeb at the end. Save the file. Now when you remote into a machine via RD Web Access, you'll be able to connect successfully. That's about it. 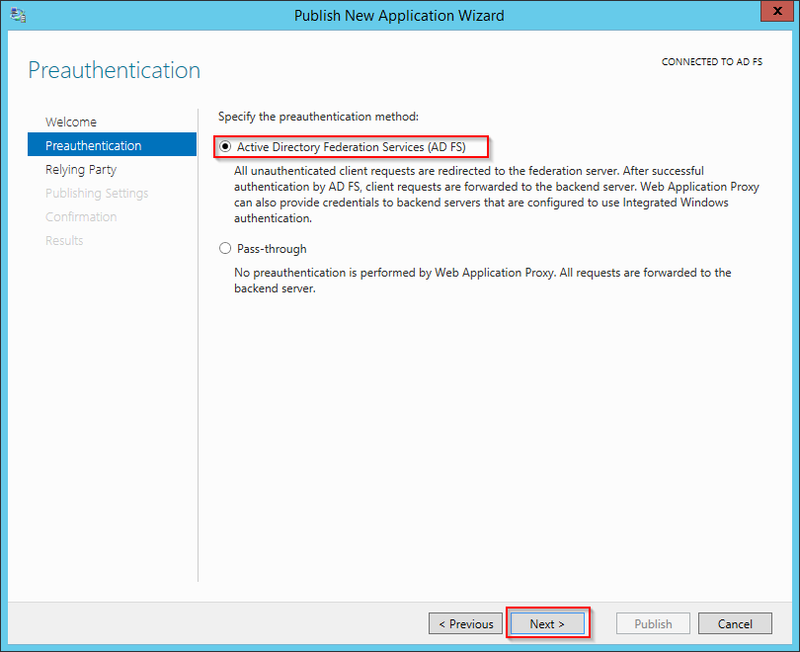 If you've followed the instructions, you should have RD Web Access and RD Gateway working behind Web Application Proxy, with AD Federation Services for preauthentication. Tom, does this allow you to use a RDP file externally with the RDP geatway settings saved in it? or do you have to login to RDweb and then use the Connect to a remote PC feature? Hi Adam, following this guide will explicitly PREVENT using a saved RDP file. The reason is because of using the ADFS preauthentication. Basically WAP won't pass the connection to the backend server unless you have authenticated against ADFS first. When you authenticate, WAP issues a cookie to your browser (also called an edge token) that allows the traffic to flow past WAP and onto the backend server. When using a saved RDP file, you won't have access to the edge token, and WAP will block the traffic. That being said, the real use case for setting up RD Gateway behind WAP in this manner is if you want to force your users to login using RDWeb. In my case, we have a third party two-factor authentication product that integrates with the RDWeb login page. Users were saving RDP files and using mstsc.exe to skip RDWeb and connect directly to RD Gateway, essentially bypassing our 2FA. By setting up WAP with ADFS preauthentication, we are preventing this backdoor access and forcing users to user RDWeb and 2FA. Thanks for the response, I am trying to design a solution for external contractors to get in to our network and have put this option on the table. Hi Tom, great post, thanks. Couple of questions. Where does your RDS Gateway/Web server sit in your network, the DMZ or WAN? What if any ports did you have to open to it from the WAN or does it flow through the Web proxy? Also, any recommendations on 2FA solution? Hi Joshua, you'll want the WAP server in the DMZ network, as that is what users will be directly connecting through. 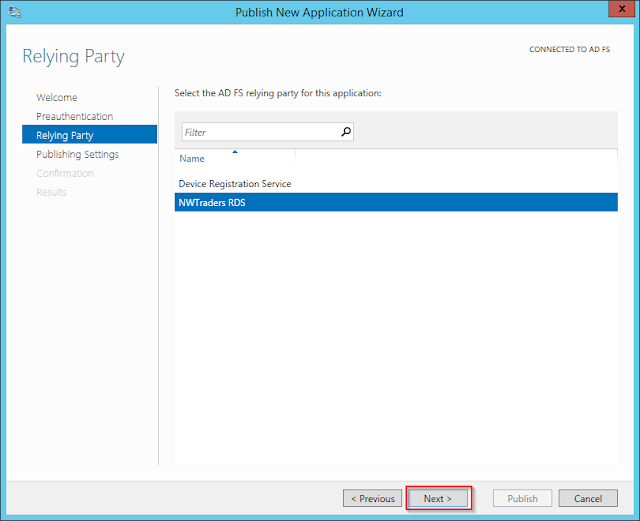 ADFS and RD Gateway/RD Web Access can actually be in your internal network. You'll only need ports 80/443 open on the external firewall to the WAP server. The internal firewall is a little trickier, you'll need 80/443 open between the WAP server and the RD Gateway/RD Web Access server, but you'll also need to open 443 between the WAP and ADFS servers. In my testing, I could only get this working properly if the WAP server was a member of the internal domain, so you'll need to open standard ports for AD/DNS/Kerberos, etc. Thank you for the great post, does this auto sign you in to the RDWEB page and also are you prompted for credentials when launching a RemoteApp? Unfortunately the user will NOT automatically be signed into the RDWeb page - that sort of integration between WAP and RDWeb just isn't there yet - though when I spoke with Microsoft, they did make mention of that functionality possibly being included with the next version of WAP in Windows Server 2016. The good news, however, is that RDWeb SSO continues to function when launching RemoteApps as expected. 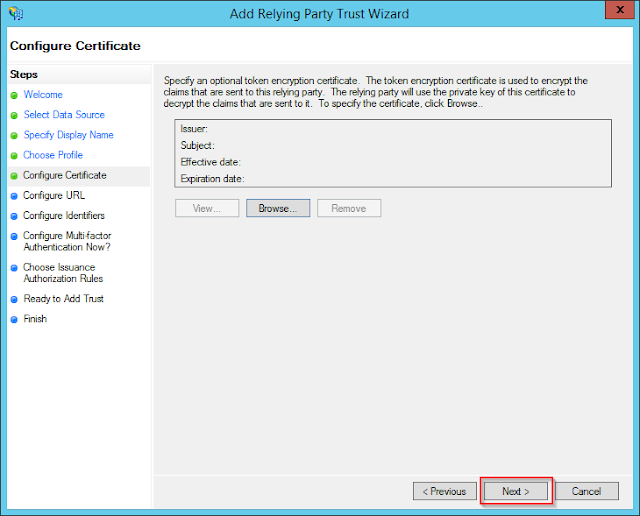 So as long as you have the proper certificates and SSO is working before WAP, it will continue to function after WAP. However, prior to seeing this article, i had published RDWeb (& Gateway) using Non-Claim aware application template. 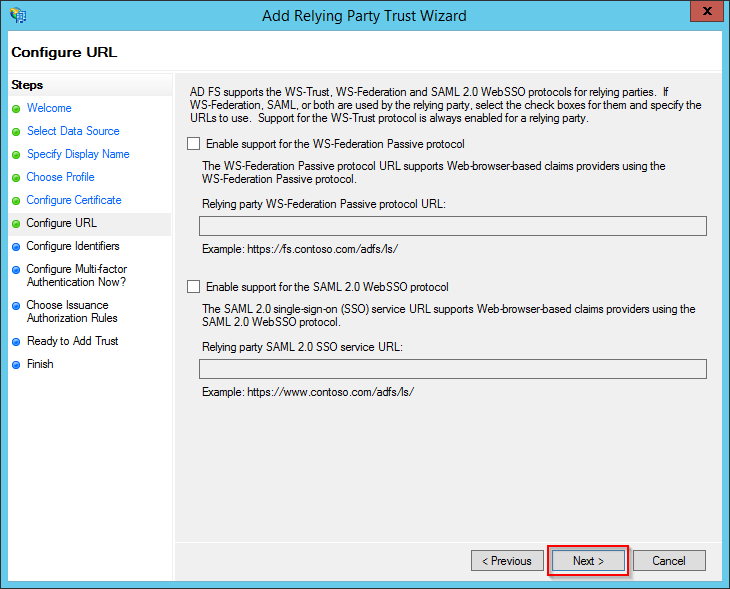 I was able to access RDWeb and SSO was also working fine. While launching any remote applicaition, i was being prompted for credentials and even though i was providing correct credentials, i was not able to login. Now, after reading this article, i have changed that to claim aware application. Although, i am able to login and launch application but i am being prompted for credentials three time. First is form based authentication from WAP/ADFS, second from RDWeb and then third one from while launching the Remote App. Can you please suggest if it is possible to achieve SSO? Does SSO work when accessing RDWeb/RD Gateway directly, without WAP/ADFS in the picture? Typically if SSO is not working, it's a problem with your certificates. I would suggest looking down that route. In your scenario, is RDWEB still uses FBA after ADFS authentication? Yes. 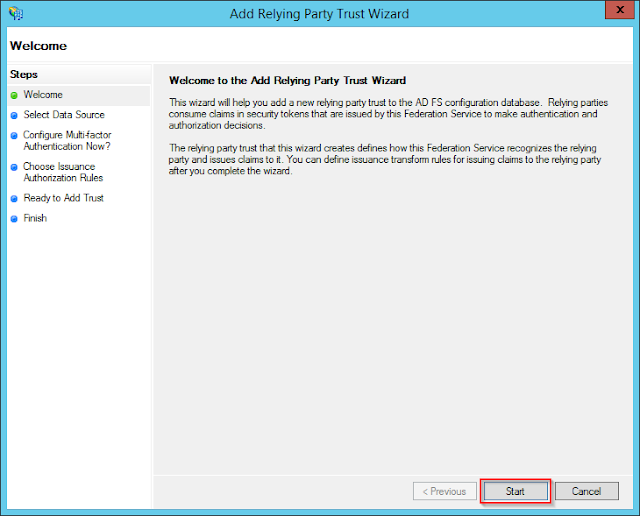 You'll still need to login to RDWeb using the standard method, WAP in Server 2012 R2 does not support any kind of SSO pass through to RDWeb. 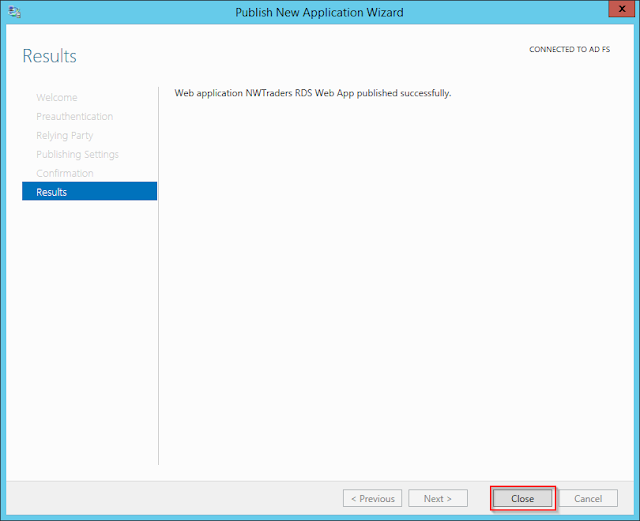 That feature might be available in WAP 2.0 with Server 2016. But strange thing which I have tested is, If we publish backend RDS as non claim aware application, SSO between WAP to RDWeb works but when we try to launch any application, it prompts for credentials once again and does not accept even if we use same credentials. Thanks for the very helpful guide. I've published RDWeb using WAP with ADFS pre auth and integrated multi-factor auth. This works well however I now have the problem in that I can't use the "connect to a remote PC" function in RDWeb because of the pre-auth requirement I assume. My users have to connect to the RD Session Host and from there RDP to their PC. Do you know of a workaround to this problem? Also, has anyone been able to get SSO working on RDWeb to avoid the double sign in? I know you said it's not supported but hoping someone might have a solution. Hi John - check out the section above "Modifying Desktops.aspx" - that has instructions for modifying the "Connect to a remote PC" page to work with the pre-authentication. 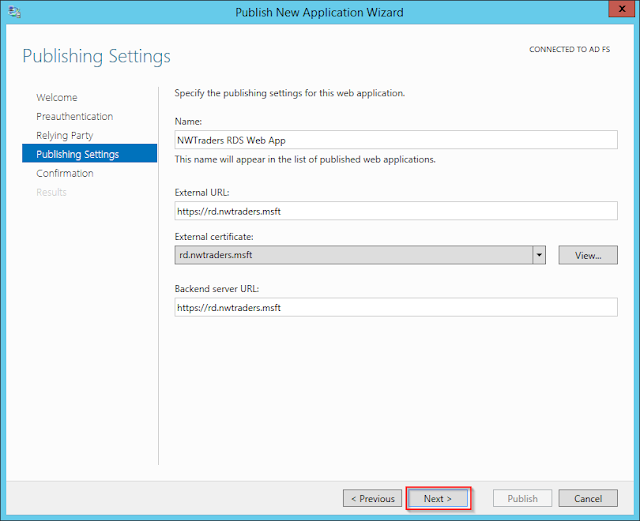 "Authentication to the RD Web Access server will still use the RD Web Access form logon. 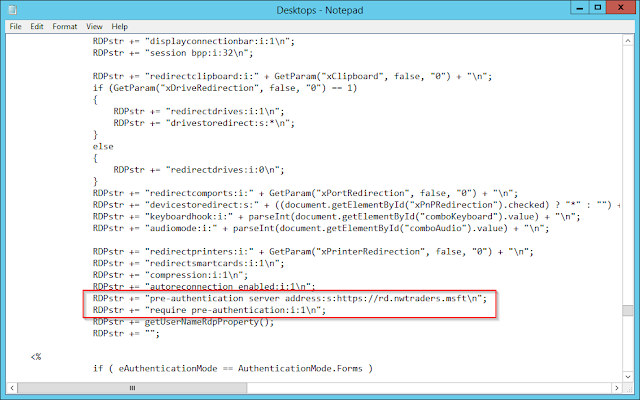 This provides the least number of user authentication prompts as the RD Web Access logon form creates a client-side credential store that can then be used by Remote Desktop Connection client (mstsc.exe) for any subsequent Remote App launch." oops I completely missed that section. Thanks! Thank you for writing this article. It has cleared up alot of confusions! I have to say Citrix Netscaler seemed to have had all this figured out a long long time ago (in there own way of course).. but due to budget constraints this worked perfectly for our needs. Excellent article thank you! I am about to setup RDGateway in the DMZ using WAP and ADFS just as you have demonstrated. The only concern is that the existing WAP cluster servers are in a workgroup. 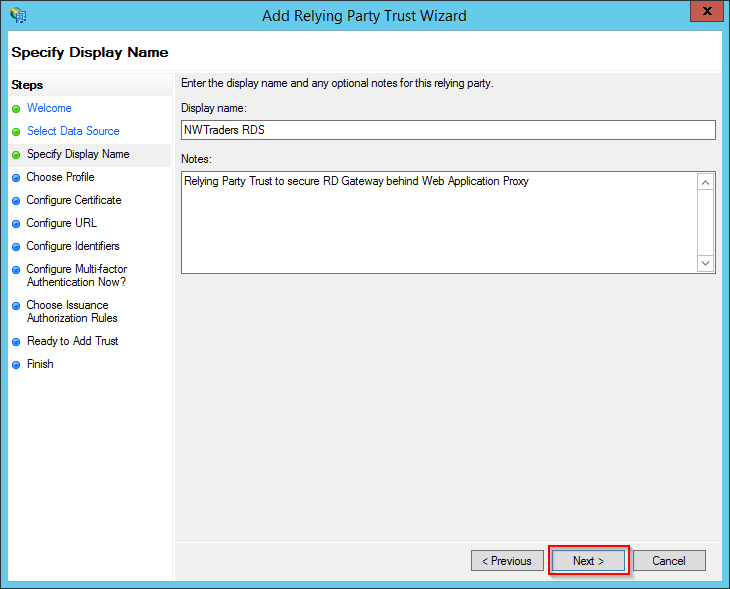 I hope I can still publish the RDGateway using the ADFS relay party. If you have any new info on how to accomplish this, please share. I didn't try with the WAP servers in a workgroup. I know it did not work when the WAP servers were in a different untrusted domain though, so maybe you'll have better luck in a workgroup scenario. Hi. Our WAP servers are also in DMZ. I have tried to get this work but RemoteApps do not start. Looks like ADFS authentication works and i can also logon to RD Web Access but when trying to start RemoteApp, Remote Desktop cannot connect to remotemachine. 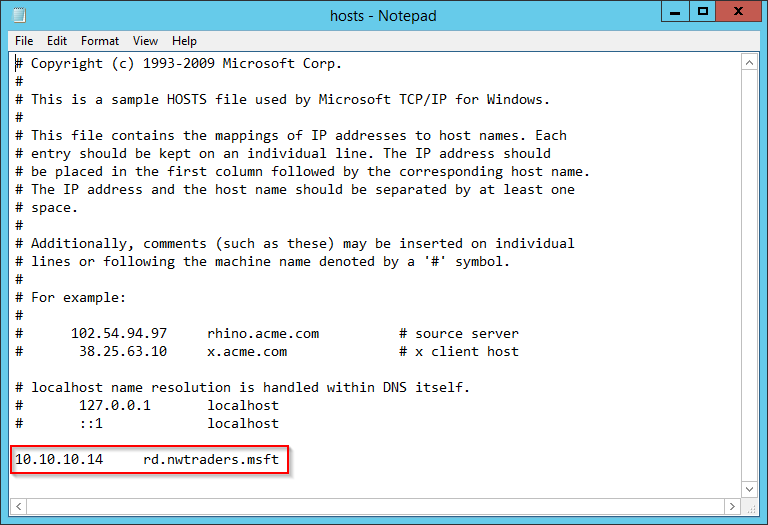 Reasons are your user account is not contained in RDG user list or remote machines computer name is in NetBIOS format. Is this expected behaviour when WAP-machines are not domain connected? We've managed to get this working now but only through IE. I understand the point of this is to explicitly prevent using saved RDP files. Using other browsers like Chrome and Firefox downloads the RDP file which obviously doesn't run. Does this mean that we are limited to using only browsers that support ActiveX (i.e. Internet Explorer)? Or have I missed something? You are correct in that only Internet Explorer will support this method. 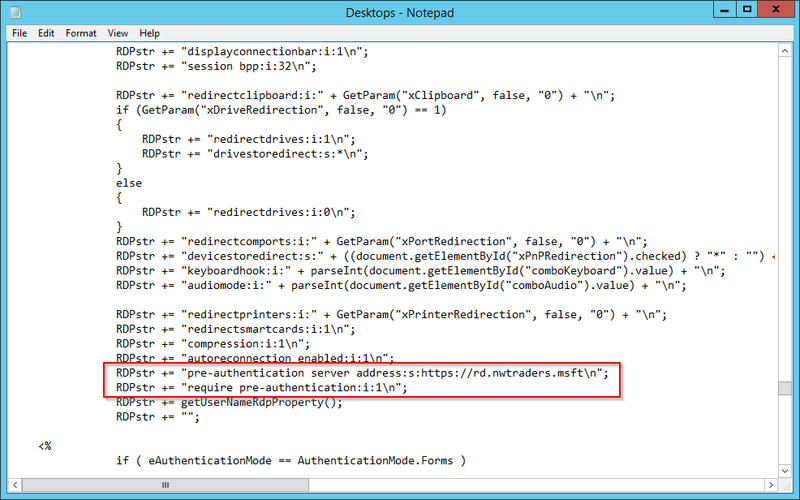 The RDP ActiveX control within IE handles passing the authentication cookie between the browser and mstsc.exe. Other browsers don't support ActiveX, and thus won't work. It'd be nice in the future if Microsoft would remove the requirement of ActiveX and instead find a way to replicate this functionality using HTML5 for cross-browser support. Thanks for the rare find regarding this info. It seems like ADFS 3.0 and WAP are not that often written about - I have come across more ADFS 2 and ADFS 4 preview articles than ADFS 3. I am struggling with making my way through ADFS and WAP with regard to publishing a simple internal hello world website. Are you aware of any other resources for publishing a non-claims-aware site? 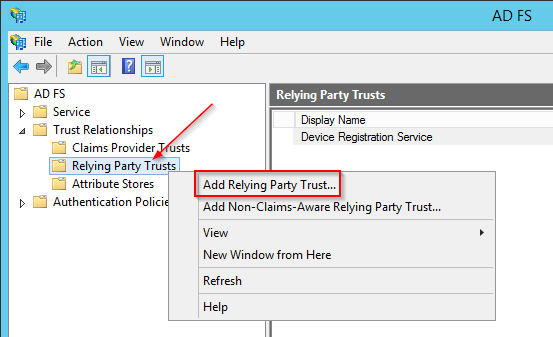 It seems the only examples I can find are sharepoint and OWA, but those are so Microsoft-richly-integrated that I dont know that the concepts are even the same for non-claims-aware relying party trust. This posting was a great life saver. I really appreciate you taking the time to provide your documentation. I have a question regarding ADFS to RDWeb though. Is it possible to "Auto-fill" the username and/or password fields after authenticating from ADFS? I know that the end user is required to ALSO authenticate the RDWeb page, but is it possible to make it easier by auto populating the required fields? Not that I know of, but that would be convenient. Supposedly in Server 2016, there will be further integration between WAP and RDWeb that will allow single-sign on between the two. Thanks Tom for that great post! 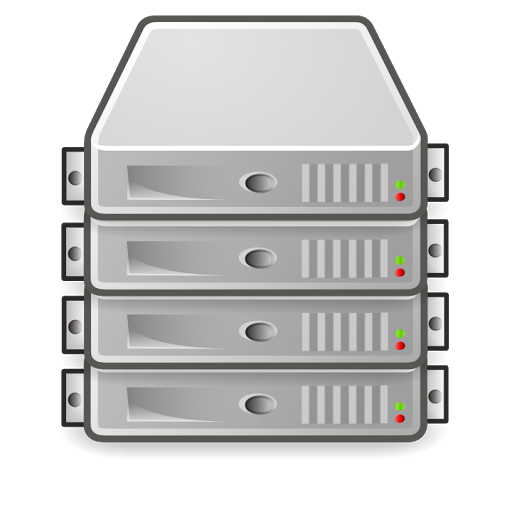 In our scenario, RDWeb and RDGateway are hosted on different servers with different host names. How would the WAP and ADFS configuration need to be adjusted to cope with that setup? In the post you noted to "Enter the external URL that users will use to access your RD Gateway/RD Web Access installations" and to use the same name for the backend URL. That's working, when RD Gateway and RD Web Access are sitting on the same internal host. How to do this if they are on separate servers? I was wondering about the Hotfix KB2982037. This site is not available anymore. Is it still required or is this fix included in never updates? Thank you very much Tom. I will continue my configuration. Your post is awesome. Just adding that it works very well too if you select "Pass-through" under "Specify the preauthentication method" TAB. This way ADFS login page can be skipped and you can directly access RD Web login page. Only backdoor that I see is it allows direct connections to back-end resources when specifying GW settings in MSTSC but that can also be managed by limiting "RD Gateway-managed group members" in Resource Authorization Policies to RDSCB and RDSH servers for which access can be further controlled by applying server level restrictions. I'm confused, should this work in Chrome/Firefox/etc? Because in those browsers it just downloads a .rdp file. And i'm not sure how opening that would "retrieve the ADFS edge token from the browser". Saw the other comment, disregard this. I have followed this guide step by step but am still encountering an issue. I can pre-auth to rdweb then login to rdweb and launch an application but the application says failed login in every time and i cant get passed it. i dont think it is passing the cookie correctly to the gateway for auth. No matter what creds i enter they are never accepted. Any ideas? Great Article much appreciated, I have tried this a couple of times now and just cant get this working. Could I ask for some of your experience. Internally the RDS works fine. Externally the WAP server constantly attempts to service the RDS session. - I then get another RDP popup showing the selfsigned certificate of my WAP server. If you have any suggestions I would be very greatful, as I've been banging my head against this for a week! Followed your guide, got everything working sweet... except: the clipboard redirection ONLY works when the client is able to 'Bypass RD Gateway for local address'. The only deviation from your guide is that my WAPs are in a DMZ AD forest and my ADFS and RD* servers in an internal AD forest. There is a one way trust between the forests. You mentioned that you could only get things working properly when all the servers are in the same AD domain. Was one of the things that failed to work correctly the clipboard redirection? I can't for the life of me find any relevant info on the internet. My implementation had clipboard redirection explicitly disabled for security reasons, so I'm unable to comment. I don't like the setup where you will authenticate ADFS, then WEB and then RDP GW. I create non-claim aware party trust, set KCD to SPN for the server hosting RDWEB and Gateway, reconfigure IIS from form authentication to windows integrated auth. WAP -> adfs -> SSO to RDWEB: working great. 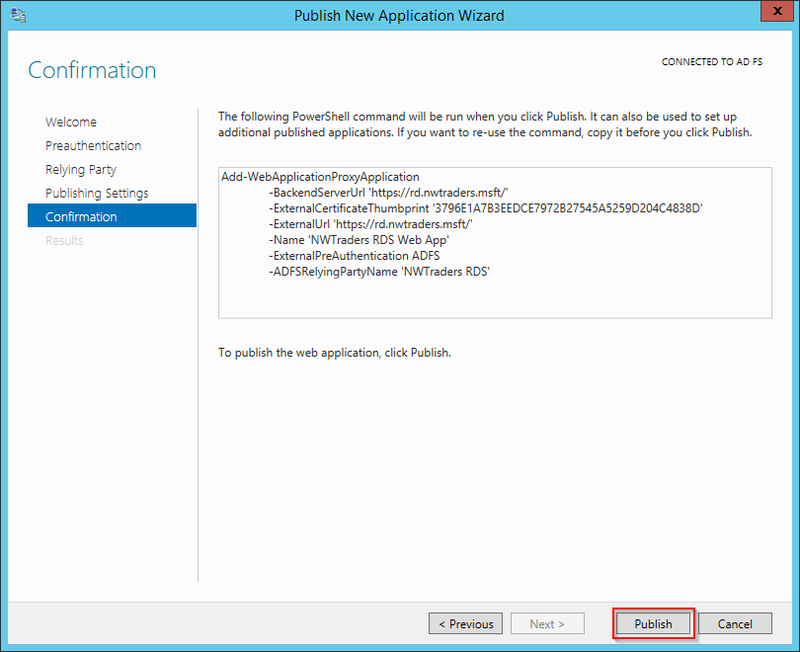 THen you need to enter credentials when running rdp file. In my setup I am using everything HA. I reconfigure RDWEB to be running under service account (IIS app pool - instead of AppPoolIdentity, set permissions for the service account, policy for the account [logon as batch, ...]). Of course - update SPN to the service accoutn. on the WAP server are just some unclear errors in Event log. Did you or someone try to setup RDWEB / GW under service account behind WAP? Does anyone knows if there were any improvements in RDS 2016 and WAP? Thanks for this guide it's brilliant. Question though I have users that use the rd client for iPad and iPhone and when I setup are rd remote app with adfs the client stops working. Do you know if the client supports this? Or is there extra config needed. I do not believe this configuration will support iOS devices. 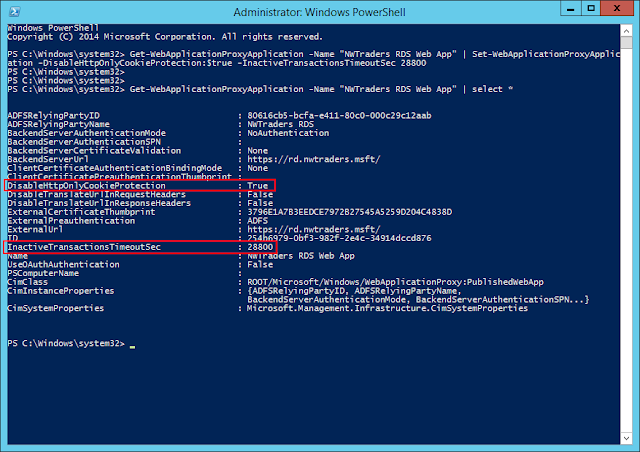 WAP sends the token to RD Gateway via an ActiveX control, which isn't going to work w/ iOS. Is there anyone here who has overcome the credentials popup when launching a remote app or a remote desktop on the RDWeb page? I also have SSO to RDWeb through ADFS without the use of WAP. Good day, is it possible to have the WAP server in another domain than the ADFS server? The environment has a seperate domain for all DMZ infrastructure. So WAP in DMZ domain and all other components in in internal domain. We are facing the problem that credentials are not passing correctly from ADFS to RDWeb page. In IE credentials are passed from ADFS to RDWeb, but you don't get to the actual app page. You reach the RDWeb page were credentials are filled, but you still need to click sign in. In Chrome no credentials are passed at all and you need to re-enter them. Hope I am clear enough... Anyone experience with this issue? Hi Thomas, theoretically it should be possible, and yes, having the WAP server in a perimeter network as either non-domain joined or joined to a perimeter domain network is certainly best practice, I was not able to get it working at the time. Have you had any luck getting a non-domain joined WAP to function properly with RDG’s? No we never managed to get this working. At the end we've chosen for a VPN based solution as an alternative.